And here’s another edition of Time Warp Tuesday. A typical pose for me, always reading, and I’ve been a fan of Halloween all my life. 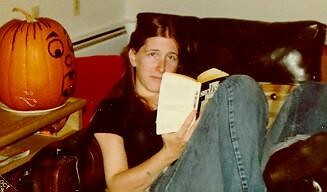 This was shot at a boyfriend’s apartment, probably about 1979, 1980 or thereabouts (his name was Chuck King and he was related to the famous author). Wonder what that book was? Can anyone tell? You look so serious here. Are you sure you liked this guy? I wish I could make out the title! You look a bit annoyed to be disturbed! I finally got back to reading this year, after an absence that was way too long. The Shining? I remember when you looked like that! You know, I still see us the way we looked when we were in our teens! Do you remember what you were reading? I don’t know if I have any pictures of me reading–and you’re right, it’s something we’ve done a lot of. Very cool.